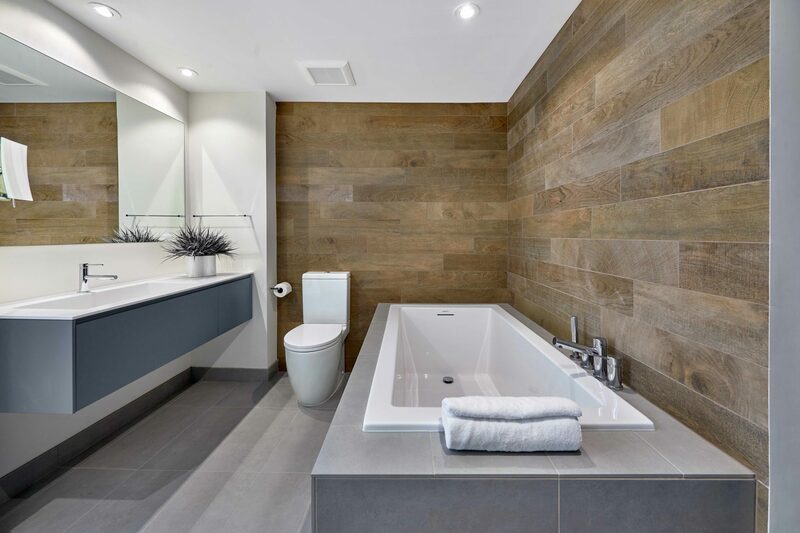 This contemporary bathroom has a minimalist and modern style. 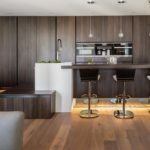 A clean and sleek look with inlaid grey tile transitions seamlessly to a modern wooden wall design to give a warm impression in an otherwise cool space. 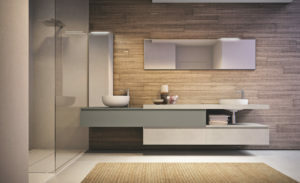 The ensuite bathroom has an open concept, with contemporary bathroom cabinetry finished in Azzuro India Ultramatt Lacquer. There are strategically placed mirrors from the same collection as the bathroom furniture, with recessed lighting grazing the wall to flatter and soften the surrounding spaces. The integrated countertop and sink in solid surface with matching solid surface drain, allows for ample space on the counter. The low-profile edge bathtub with the linear overflow blends in with the surrounding area of the bathroom. 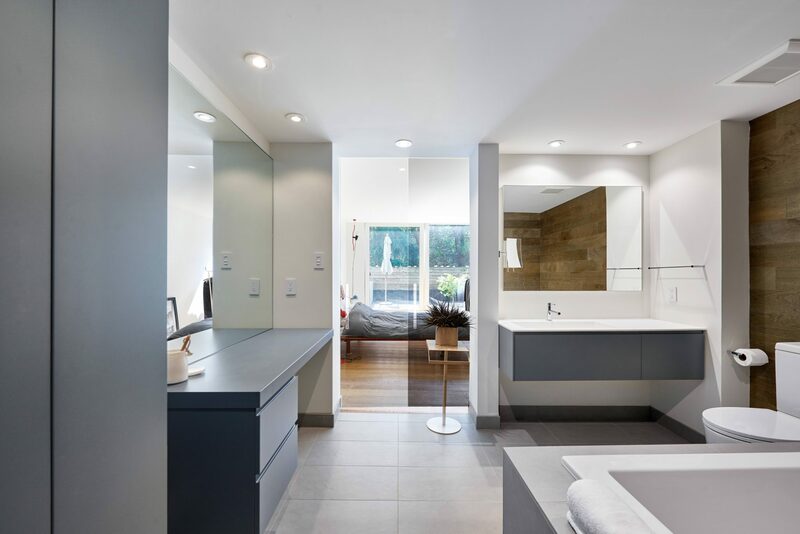 This open concept bathroom leads to a modern Anteprima walk-in closet by Pianca. 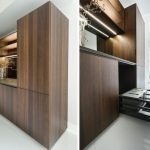 Smoked oak ecoveneer, oxidized metal hanging rods and linear LED lighting create an elegant showcase for beautiful clothes. 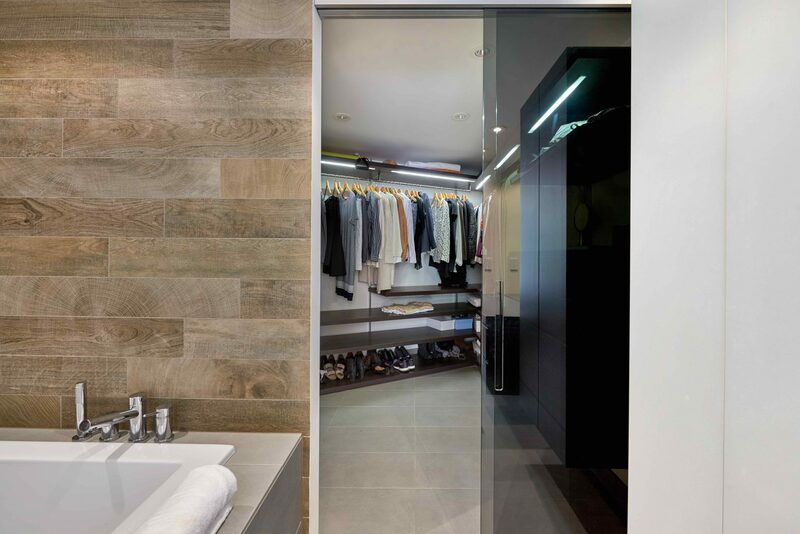 The entrance doorway leading from the bathroom to the closet is made seamless with the continuous grey tile flooring, separated with a frameless Cristal sliding doors in smoked glass by Pianca. Similar glass doors serve as a room divider between the bathroom and bedroom for additional privacy. Shaughnessy,Vancouver, BC.